Develop competitive advantage with our above template which contains a diagram of earth globe on lifebuoy. This image clearly defines the concept of environment and security. 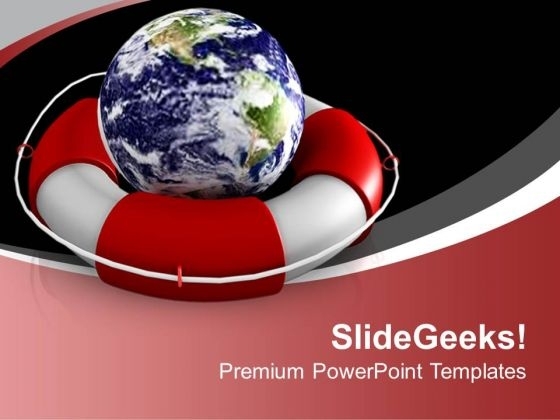 Adjust the above image in your PPT presentations to visually support your content in your Geaographical PPT slideshows protection, atmosphere and global PPT presentations. Our PPT images are so perfectly/ideally designed that it reveals the very basis of our PPT template to make your clients understand. Our Protect Earth Geographical PowerPoint Templates And PowerPoint Themes 1012 make many a feat feasible. They ease out all difficulties. Compete with the world with our Protect Earth Geographical PowerPoint Templates And PowerPoint Themes 1012. You will come out on top.